Can I add users from the Dashboard? What user oriented operations can be performed from the Dashboard? Can I assign admin control to users? What is a Group? How can I create a Group? How can I add users to the group? Can Admin propagate settings to a particular group or multiple groups? Is it possible to lock particular settings for groups or users? As an admin, can I assign encryption key type to user accounts? How do I manage computers from the Dashboard? How do I change the settings across all the connected computers from the Dashboard? Can I remotely update the latest versions of IDrive on any connected computer? What is legal hold? Can Admin block or put a legal hold on a user account? As an Admin, can I view and download the files from user accounts? Can Admin generate reports for each user account? Can I view the total number of backed up files, its status, etc., in the Backup Activity Report? How can I generate Backup Activity Report between two dates? As an Admin, can I disable the notifications from desktop application for user accounts? What is a Policy? How can I create it? Can I propagate a Policy? If yes, how? Can I edit a Policy? I need to delete a Policy. How can I do that? I am unable to manage my machines running on Windows XP and Windows Server 2003 operating systems remotely via the Dashboard. Why? Dashboard is a centralized console where you can manage backups, view and monitor your IDrive account activities for all your connected computers with ease. You can also manage data backups, restores, application settings etc, on your faraway computers from the Dashboard. From the Dashboard, you can create new user accounts, view the information about each user's storage utilization, monitor recent backups performed by them, view log activities and also make changes to backup sets and settings across all devices. Computers – From the Computers tab, you can manage your data backups, restore files/folders to the corresponding computers, modify application settings, view logs and do much more on each of your connected computers. Settings – From the Settings tab, you can configure your IDrive settings and push changes to all the connected computers, at the same time. 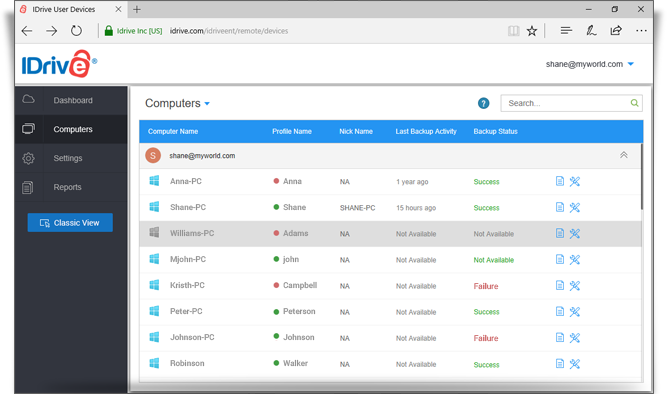 Reports – From the Reports tab, you can generate, view and download reports for each user account. Account details: You can view the total number of IDrive users under your account and the number of admins. Plan type: You can view your current IDrive plan, the total storage space available and the used storage space. 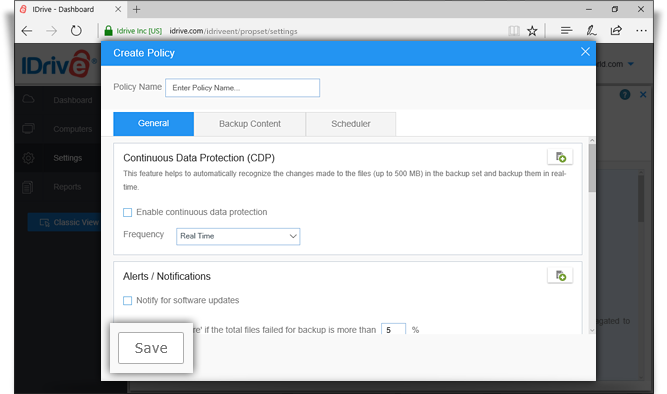 You can also view the average backup size and the maximum backup size. 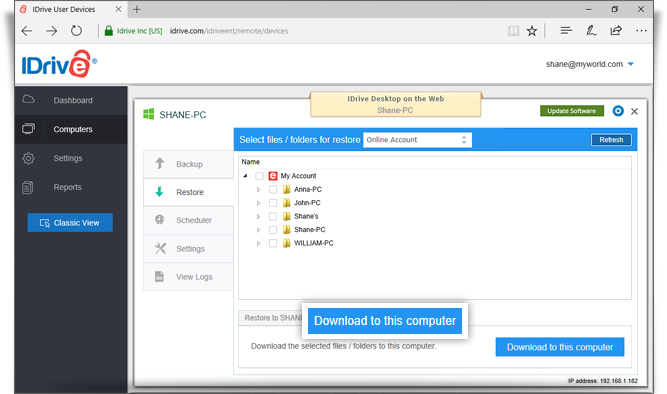 Yes, you can add users to your IDrive account and manage backups at one place. There are three different ways to add users to your account using Dashboard. To add multiple users at once, you can either enter information manually for each user or upload a text file with the list of users. Login to IDrive, and click the 'Dashboard' tab. Click , and select 'Add Users'. Enter the user's 'First Name', 'Last Name', 'Email Address', and 'Password'. Confirm password and select encryption type for the user account. Download and install the IDrive application on the user's device and login with the newly created account. Delete the sample entry for 'Alexandra'. Add the information for your users in the following format (one line per user): "FirstName,LastName,EmailAddress,Password"
Drag and drop your saved users .txt file onto the 'Upload or Drop your file here!' area. Alternatively, click the area to browse for your user .txt file. A confirmation message appears after adding the users. Download and install the IDrive application on the users' device and login with the newly created account. Note: You can add up to 5000 users at a time using the text file. Click , and select 'Invite Users'. Note: You can enter multiple email addresses separated by comma. Your users will receive an email with instructions for getting started. You can add or invite users, edit, block, and delete users from your account. You can also make the users as admin from the Dashboard. From the 'Dashboard', select the users for whom you want to edit the details. Click . The 'Edit' screen appears. Update the required details and click 'Save'. From the 'Dashboard', select the users you want to block. Click . The 'Block Selected Users' screen appears. From the 'Dashboard', select the users you want to delete. Click . The 'Delete Selected Users' screen appears. Yes, you can make other users as admin and assign them admin controls from the dashboard. Users assigned as Admin can add or invite, edit, block, and delete users from your account. From the 'Dashboard', select the users for whom you want to grant the admin rights. Click . The 'Grant Admin Rights' screen appears. Select the required role and click 'Yes'. A group is a list of users whom you can organize for a variety of purposes. You can propagate many settings, monitor backups etc. 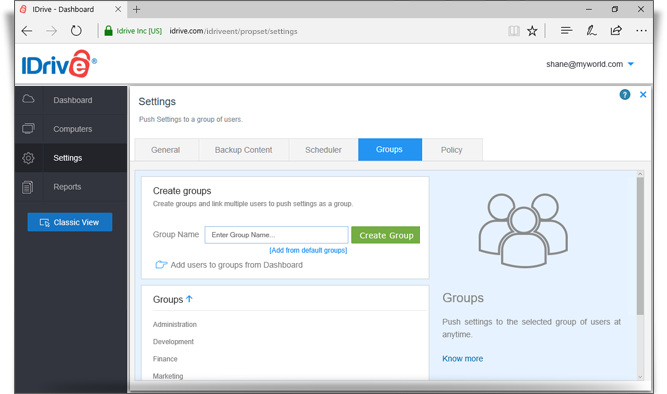 Up to 200 groups can be created with any number of users and a user can be a part of multiple groups. Click 'Settings' and go to the 'Groups' tab. Provide the group name and click 'Create Group'. A success message would appear on the bottom-left of the screen. You can see the newly created group in the 'Groups List' section. Select the users to add and click . Select the group you want to add the users to and click 'Save'. The selected users are added to the group. Yes, Admin can push the settings to a particular group or multiple groups. Go to the 'Settings' tab and click against the particular settings you wish to propagate. Select 'All Users' or particular groups, to propagate the settings for the selected users/groups, and click 'Push'. A confirmation window appears. Click 'Yes'. 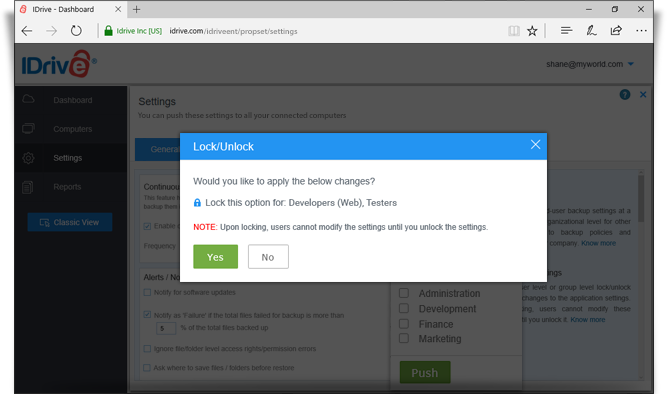 Yes, the Admin can lock particular settings for a user or a group of users. Users cannot modify those settings, till the Admin unlocks it. Go to the 'Settings' tab and click against the particular settings you wish to lock. Select 'All Users' or particular groups, to lock the settings for the selected users/groups, and click 'Push'. 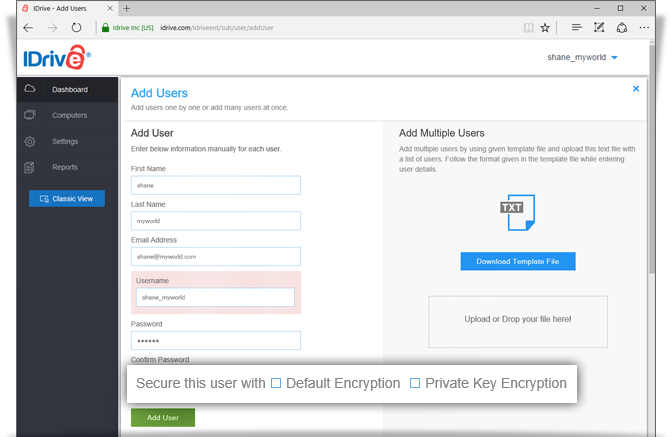 Yes, you as an admin can assign encryption key type to user accounts. When adding users, there is an option to 'Secure this user with Default Encryption/Private Key Encryption'. Admin can select either of the two options, to assign an encryption key type to the user account. If the encryption key type is not assigned by the admin, the user would be prompted to choose Default Encryption/Private Key Encryption the next time he logs into his account. You can manage all connected computers from the ‘Computers’ tab on the dashboard. You can also view backup details like last backed up time and the status of each backup. Click the 'Computers' tab. The list of all the backed up computers appear here. 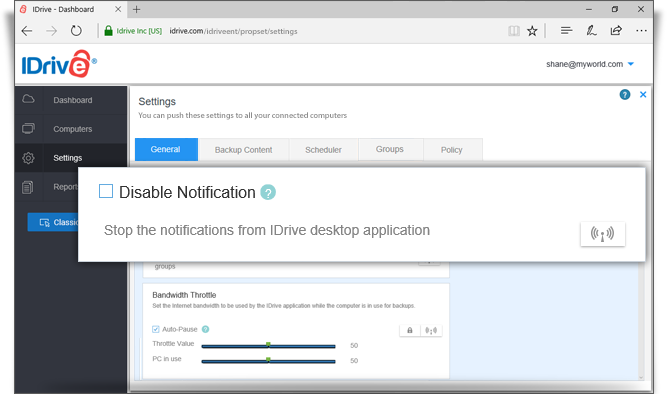 Click the computer name, to view the IDrive application interface on the web. 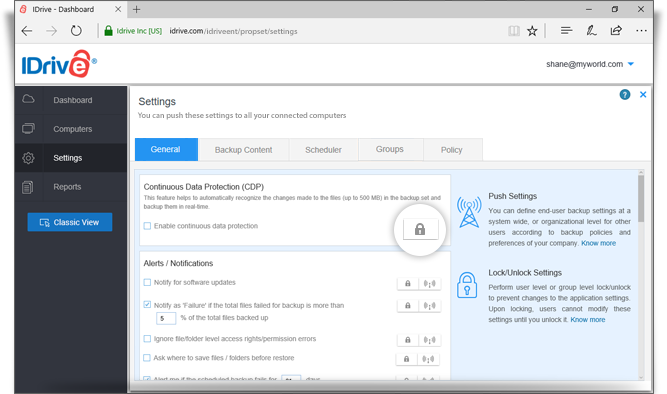 Perform data backups, restore files to the respective computers, configure application settings and view logs of your connected computers. You can change your IDrive settings and push the same changes to all the connected computers with ease from the Dashboard. From the 'Settings' tab, change the settings as required. Click against the particular settings to push the settings to all the connected computers. Can I remotely update to the latest version of IDrive on any connected computer? 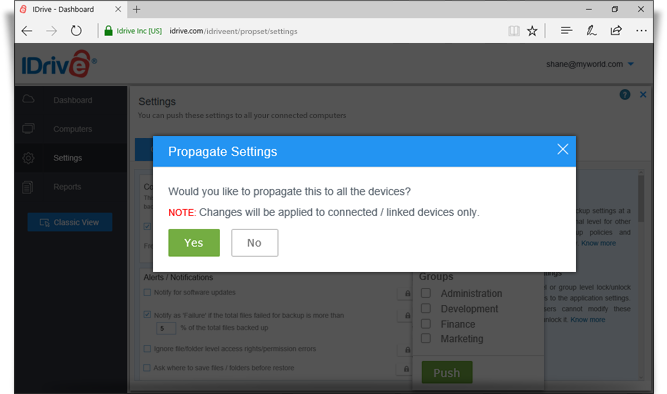 Yes, you can remotely update to the latest version of IDrive on any connected computer via Dashboard. From the 'Computers' tab, click the particular computer name on which you want to update the IDrive application. Note: Make sure the computer is 'Online' (green) and web access is enabled. On the top right corner, click 'Update Software'. The latest version of IDrive will get installed on that particular computer. Legal hold is a process which allows the admin to block a user account. The user will not be able to access his account, but Admin can actively access his account and download data. 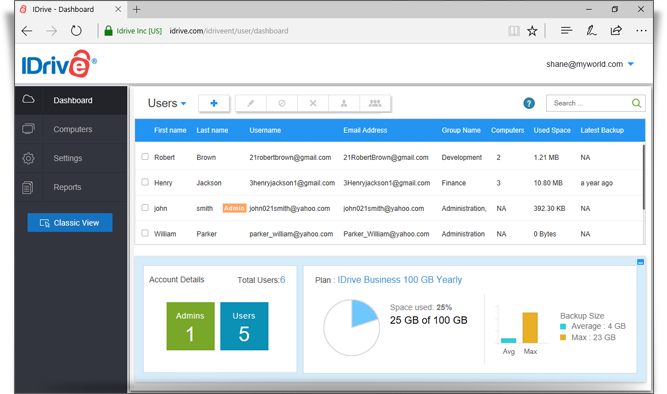 Login to IDrive as admin and click the 'Dashboard' tab. From the 'Dashboard', select the users you want to unblock. Click . The 'Unblock Selected Users' screen appears. Yes, Admin can view and download the files from user accounts to his local computer. 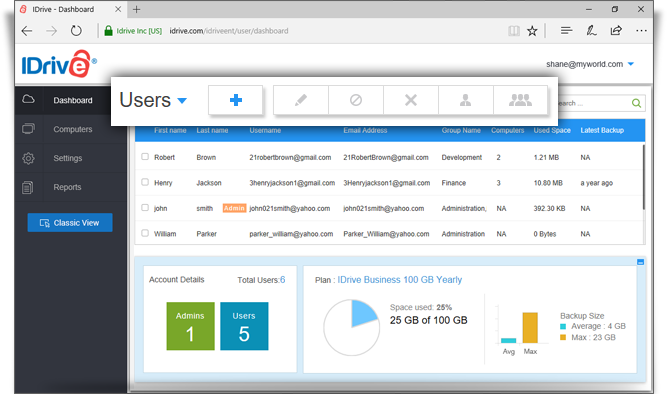 Login to IDrive as admin, and click the 'Dashboard' tab. Click the 'Computers' tab and select the computer of a particular user. Go to the 'Restore' tab and select the files you wish to download. Click 'Download to this computer' to download the selected files to your local computer. - If the user account is 'Private Key Encryption' enabled account, then a prompt would appear to verify the private encryption key to download the files. - Maximum size limit for folder download is 650MB or 600 files. Yes, Admin can easily generate, view and download reports for each user account. By default 'Device Status Report' is selected. To generate 'User Backup Report' or 'Backup Activity Report' select the same from the drop-down menu. Fill details in the fields to filter your search. Note: You can also save the report in CSV, TEXT, PDF formats. To save, click 'Save Report As' and select the file format. Yes, you can view various details like the number of backed up files, its size, status, etc in the Backup Activity Report. By default 'Device Status Report' is selected. To generate 'Backup Activity Report' select the same from the drop-down menu. How can I generate 'Backup Activity Report' between two dates? Select 'Range' from the 'Date & Time' filter and select the required dates. The report is generated based on the selected date range. Yes, you can disable the notifications from desktop application for user accounts. All you need to do is enable and propagate 'Disable Notifications' under the 'Settings' tab to stop notifications. Login to your IDrive account. Go to 'Dashboard' and click on 'Settings'. Select 'Disable Notification' and click . Select 'All Users' or required groups to propagate this setting. Admin can view the notifications under the 'Reporting' section. A policy is group of settings. You can propagate these policies to a group of users to push the settings to them. 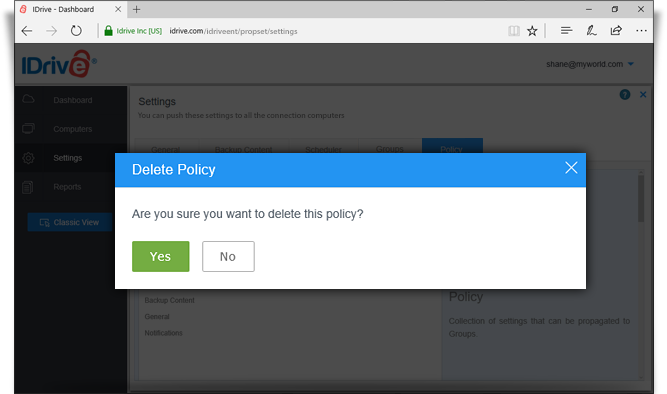 Also you can edit and delete policies as required. Click 'Settings' and go to the 'Policy' tab. 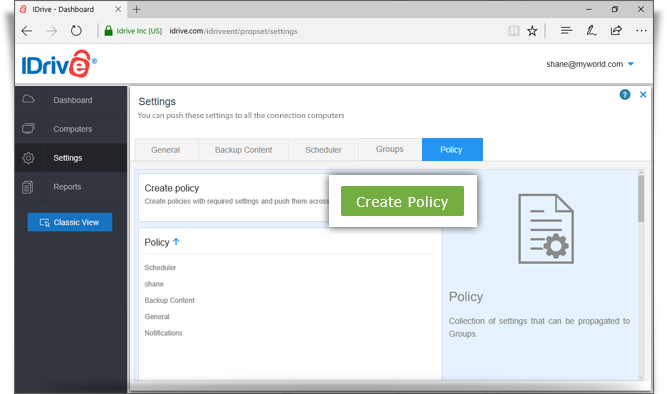 Click 'Create Policy' and enter the 'Policy Name'. Select the required settings and click 'Save' to create a policy. The created policy appears under the 'Policy' list. Yes, you can propagate a Policy for groups associated with it. Hover over the policy you want to propagate and click . 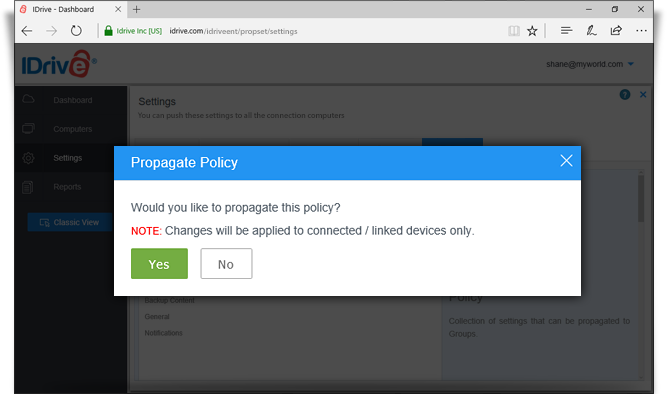 Click 'Yes' in the confirmation pop up to propagate the policy. Note: Changes will be applied to connected and linked devices only. If no groups are added for a Policy, you need to add groups before propagating it. Hover over the policy you want to add groups to and click . Click 'Add' next to the group you want to add the policy to. Yes, you can edit and modify a policy. Hover over the policy you want to edit and click . Edit the required settings and click 'Save'. You can also save it as a new policy by clicking 'Save as new policy'. Hover over the policy you want to delete and click . Click 'Yes' in the confirmation pop up. Due to security reasons, machines running on Windows XP and Windows Server 2003 operating systems cannot be remotely managed via Dashboard. 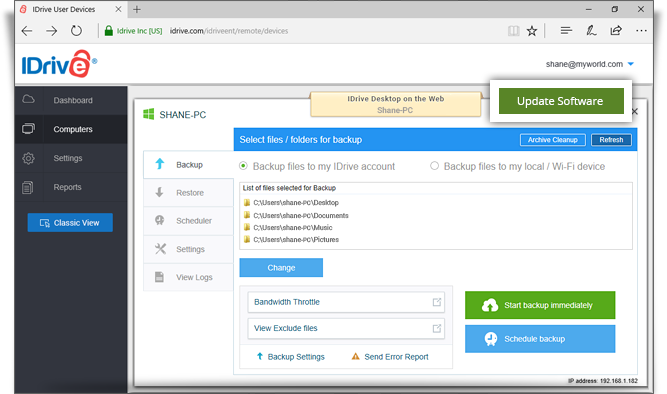 However, backups will continue to run as per schedule for these computers and servers via the IDrive desktop application. * Note: For some accounts, certain functions like folder-level versioning and version restore from Trash are not available.